Hey, everyone! This is gonna be another blog entry about a pair of gloves but this time they’re from Alpinestars! Alpine Stars are still quite new to me, I’ve not been here long enough to have seen them in here before. I’ve only ever covered a pair of Alpinestars boots before, so getting my hands on the opportunity to cover some of their gloves is quite a nice change. Alpinestars are one of those big brand names like Rev’It or Sidi that everyone knows and some even swear by them. While their stuff has a price tag worthy of a big name, they’ve usually got some great features worth talking about to justify them. 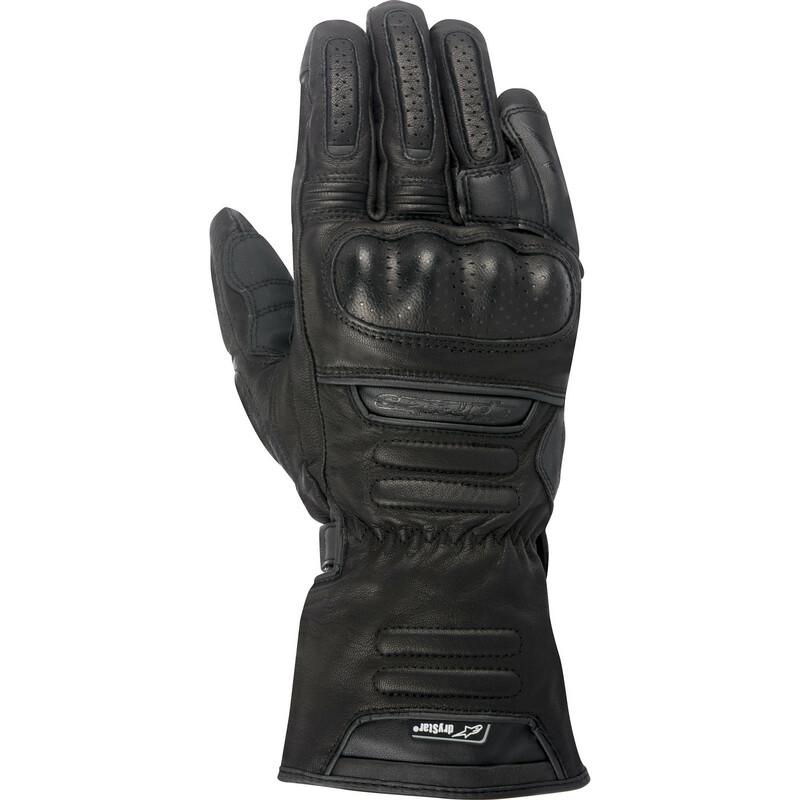 And the Alpinestars M56 DryStar Leather Motorcycle Gloves are no different, as expected, they’ve got a lot in them to talk about. 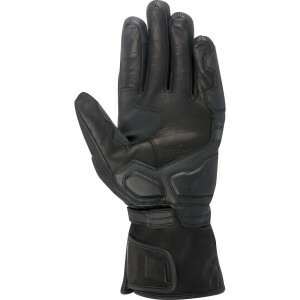 The M56 DryStars are designed as a touring glove. They’ve been constructed for comfort in mind and versatility in function but they’ve borrowed a little bit from their Sport oriented siblings. They’re made out of a tough but flexible premium Leather using a multi-panel chassis for the best levels of comfort, toughness and abrasion resistance. Its even got rubber reinforcements on the thumb and palm to give you a better grip and toughen up the seams. So you can feel safe and assured that your skin is in capable hands [I’m sorry] and that the gloves themselves will hold up in the event of an accident. Beneath the leather shell is the DryStar® membrane. Its a lining that is 100% waterproof so they should keep your hands nice and dry if the weather gets unpleasant. Its one of the many features that make this glove so versatile and usable in different weather conditions. If you are caught in the rain, as well as keeping your hands dry, the M56 DryStar gloves also have a TPR visor wipe. Its mostly for getting muck and splattered bugs off your visor but they always make me think of windscreen wipers and window cleaners. Digging deeper into the glove, beyond the DryStar waterproof lining is yet another lining but this one is for both warmth and comfort. The gloves feature Primaloft® thermal insulation, perfect for keeping your hands warm and for braving harsher riding conditions. For added comfort and flexibility, the first two fingers feature accordion stretch material to give them just a bit more flexing room and finer control over your clutch and front brake. There’s added protection all over this glove. The knuckle armour is made from a hard copolymer, a really tough and abrasion resistant plastic that’ll keep your knuckles safe in an impact or slide. You may have noticed something going on with the last two fingers as well, a bridge of material connecting them. This is one of those concepts borrowed from racing gloves- The bridge of material keeps the little finger from rolling and separating in an impact, potentially reducing injuries such as the little finger becoming dislocated or worse. There’s additional EVA padding reinforcements on the hand, thumb, finger tops and bottom of the palm that provide provide extra abrasion resistance and also help to improve the fit a bit. There’s a bit more to this glove but this covers all the really important bits. There are added extras such as reflective detailing and a cuff that is designed to go over jacket sleeves to seal out the elements. But the gauntlet of the glove does look like is could still be tucked under a sleeve, I know some people look for that when they’re out for some new hand protection.